1. Preheat the oven to 180˚C, gas mark 4. Place the salmon fillets in a small ovenproof dish, drizzle with half the oil and squeeze over the lemon juice. Season, then cover the dish with foil, sealing tightly around the edges. Bake for 15 - 18 minutes. 2. Meanwhile, heat the remaining oil in a large, lidded frying pan over a medium heat. Add the leeks and potatoes to the pan and fry for 2 minutes. Add 2 tbsp water and cover with a lid; cook for 10 minutes. Uncover, season and stir in the cream and mustard. Cook until warmed through, then stir in the tarragon. 3. 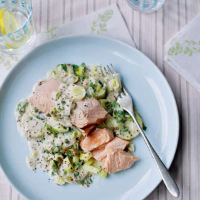 Remove the salmon from the baking dish and serve with the creamy leeks and potatoes.